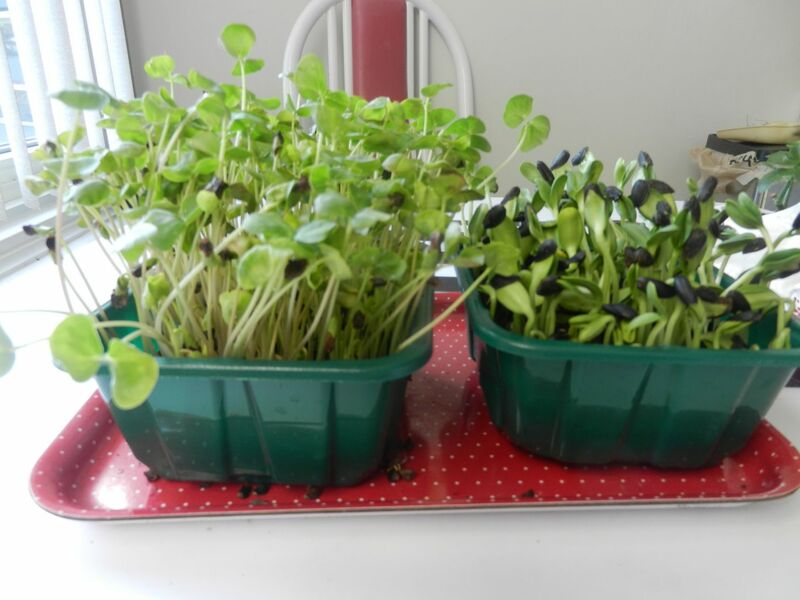 Sprouting is a great project to delve into, especially if you have no backyard garden to plant flowers and veggies. We have a patio, and my husband plants the flowers while I grow the herbs and some veggies. But “baby greens,” also called spoil sprouts, gourmet sprouts, or micro-greens can be done on your windowsill. By sprouting organic seeds, you are growing locally and organically. How good is that? Ready to harvest! Sunflower on the left and buckwheat on the right. Soak about 1/2 cup of seeds of choice in jars or bowls overnight. Next day, strain and leave in the strainer to sprout a little before planting, maybe one or to days, rinsing the seeds at least once each day. You may not see any “tails” yet. On the second or third day, fill the tubs with soil and add water to soil to moisten. Spread the seeds onto the soil, shoulder-to-shoulder, that is, don’t worry about spacing. Moisten a piece of paper towel twice the size of the tub and fold in half over the seeds. Moisten the paper towel. Cover with a dark plastic bag and tie off the end and then place on a warm windowsill. Check in 24 hours. If the paper towel is dry, moisten and place tub back in its mini-greenhouse. In 3 or 4 days you should see the black plastic looking higher than when you first planted the seeds. Time to remove the paper towel and black plastic and let the seeds sprout on your windowsill, giving them some water at least every other day or every day is the temperature on the sill dries out the soil. 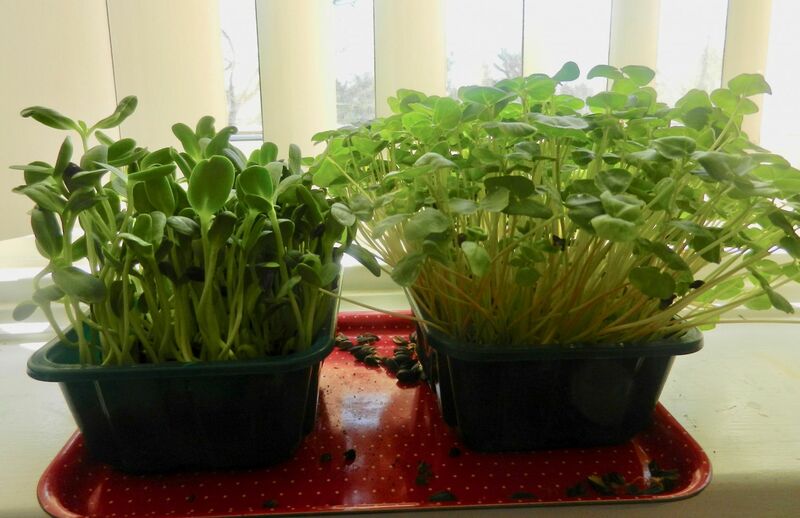 Here are the micro-greens while they are still growing. The black hulls are beginning to fall off. 5. By the time one week has passed, more or less depending on the temperature on your sill and whether or not it is a sunny window, the hulls will probably fall off by themselves and land on your windowsill, so putting a small tray under the tubs may be a good idea. 6. You can start cutting down the tallest sprouts and let the shorter ones come up now that they are not “shaded” by the earlier sprouts. The ones you cut down will not grow back, but you will get a second harvest from the shorter ones that were shaded by the earlier sprouts. 7. 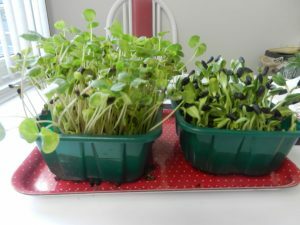 The micro-greens are full of nutrients, since if they were placed in the ground, they would become plants. And since they are eaten raw, none of the nutrients are destroyed, so only cut down what you can use each day, keeping them “alive” in the soil. Add micro-greens to salads, sandwiches, as garnish for soups, sprinkled on celery stuffed with nut butters, in wraps and just to munch on! This is a cooking-by-the-strings of your apron recipe, because a lot depends on the house temperature, the quality of the seeds, and “getting to know” what the seedlings need. I also soaked and planted peas to make pea shoots, and they spoiled before they sprouted and I had to compost them. So don;t worry if the first couple of times you have problems. You can email me at: menupause.info@gmail with questions. At my D.O.’s office last week I picked a new magazine from the magazine rack I had not seen before. It is called EXPERIENCE L!FE and the April 2019 is all about Earth Day, so I thought it would be perfect for a review. Experience Life magazine is dedicated to helping its readers live and sustain healthy lives. The magazine provides articles about fitness, nutrition, quality of life, and general health and wellness. 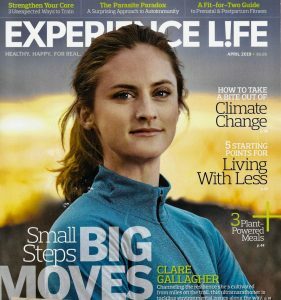 EXPERIENCE L!FE features stories written by people who have competed in marathons and triathlons about their fitness and training routines. Also featured in the magazine are recipes and guides to help readers come up with healthy dishes to serve at home….. Readers of EXPERIENCE L!FE are treated to articles about quality of life and general health issues…..Also featured in the magazine are recipes and guides to help readers come up with healthy dishes to serve at home. While the recipes are not all vegetarian, in the April issue the magazine features “Plant Power” by Robin Asbell and the recipes are all meatless, with a terrific list of whole plant foods showing how to obtain protein from meatless items, from Tofu to Chia Seeds. I hope to address some of these points in future postings, incorporating them into my Earth Day Every Day category. This is just a “taste” of this excellent magazine with beautiful photos and interesting articles. Check it out yourself! Subscriptions for EXPERIENCE L!FE run about $25 per year. You are currently browsing the archives for the Home Page category.